During my short say in New York with my wife at the beginning of the year, we had to go to one of the main touristic points of the city: Liberty Island. Although I was not so keen to visit it, it is a place to be ticked in the list of attractions you must go. 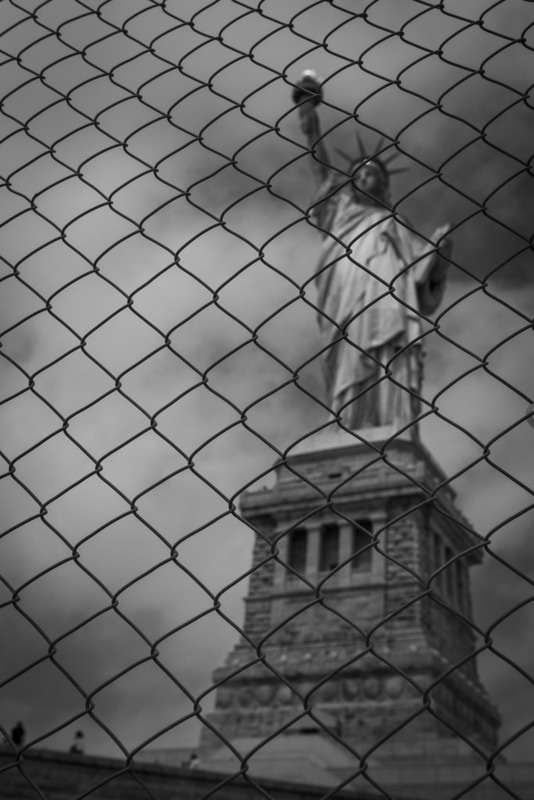 While walking the monument (which amazingly has a different ticket to go inside the Statue itself, which I declined to pay), I've noticed that the fence and the statue in the background, blurred out, could be an amazing message by itself: that Liberty so much promoted is not so free anymore. I have found the U.S. one of the most militarized countries regarding customs control. I had been several times in the past for work reasons and I have noticed it from the very first time I went there. Although its people are one of the friendliest I've found around the world, that over-protection is very palpable while exiting and transiting in. To add a dramatic touch, I have deliberately kept the exposure to the left and post processed in black and white for an additional punch. This feeling could be considered naive, but I really hope the world becomes a safer place in the future, where no fences are needed between countries anymore.